Tammy365: The Super Bowl is all about the SOCKS! The Super Bowl is all about the SOCKS! 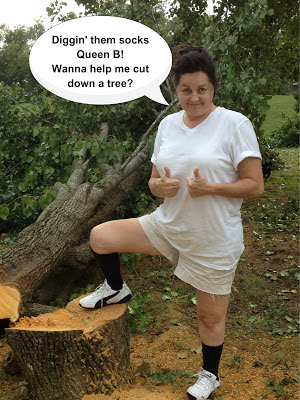 The Queen B ain't got nuthin' on this style maven! Like I say "A girl's gotta use what she got!" Look at Beyonce' rockin' with her socks on at Super Bowl 2013. I'm feelin' a bit like a trend setter! I realize my thighs can't move like hers. I wish they could. My legs aren't as long and lush. I wish they were. My heels are 1/4 inch and hers are 4/1 inch. Yes, I'd break my arches to wear heels if I could! Don't bother me none though. I've been rockin' my black socks with shorts for years now. I'm just glad she finally catched up! I'm thinking a slather of self-tanner, a black body slimmer and low-heeled black boots could land me on the half-time show of Super Bowl 2014! What do you think ladies? Would you be my back up doing those hip thrusts? I'm gonna make sure my insurance is up-to-date and send in our resumes for next year! Yes! You are so totally a trendsetter! Go you and show those young whippersnappers. (Here via Contentbrew. *waves*) What a great blog title. Did you watch much of the paralympics?? (Or is that not a good question to ask?) Do you know 'The Last Leg'?? Hello! Glad you stopped by! Happy you like the title, I was thinking about changing it. Thought it might be a turnoff? I don't watch the paralympics and that's a perfectly good question. Who is "The Last Leg"? I don't know the leg! Stopping by from SITS and you are hilarious! 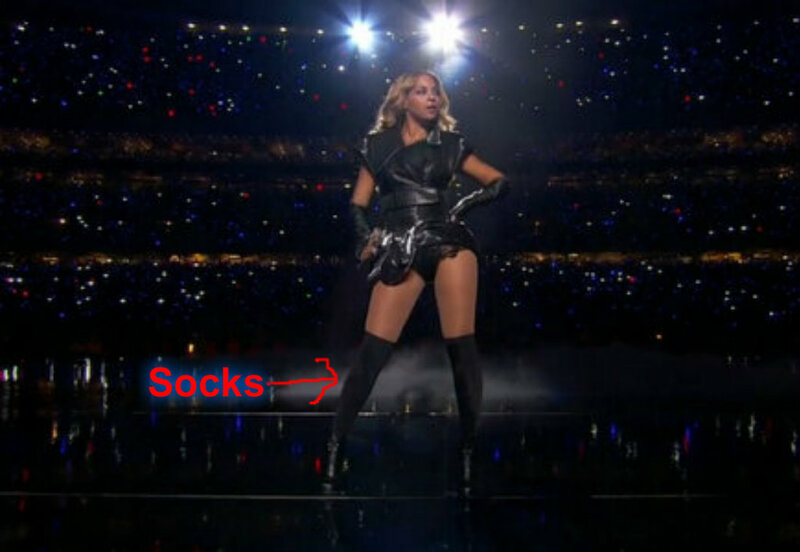 I think Beyonce should have to pay you royalties for stealing your sock style. Thanks for stopping by! Are you a lawyer? lol I'll take those royalties and pay you contingency!